Android already has a little bit of it. And if the rumors are correct, Apple’s next mobile operating system iOS 5 is going to be shock-full of it. I am talking about voice commands, which – given the cloud – are nothing but the future vocal interface for the internet. With the press now focusing mostly on hardware battles (“Can the Xoom beat the iPad2?”) we have almost overlooked some signifcant advances in mobile interfaces. Take Android’s new map application: You push a button. You say “From here to the next McDonalds”, and the phone guides you there. Amazing. Android now has voice enabled mobile search, email writing and even translation! However, this is about more than just establishing a really useful connection between products and people. In my book, the future wants to look a lot like StarTrek. So how do people aboard the Enterprise use their computers? Textinput via keyboard is reserved for really complex operations. Entering coordinates for a new course, maybe. But if you want some information, you just ask. We are approaching a time when keyboards will be our second choice of input. Combined with the first samples of semantic intelligence, that’s going to make computers beautiful and simple and great and everything I want. But I feel this will also have an effect on the tone of voice on the web in general. If you look at forums and written feedback on the net, you can’t help but thinking there’s a gigantic gashing hole along the starboard side of civilization. The flaming wars on Usenet were fluffy cotton candy against the invectives people hurl at each other on any given forum today: whether they talk about the Miami Heat, nuclear power or a new mobile phone tariff. 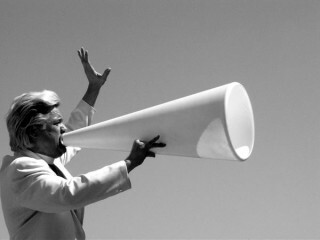 An internet of voices should put a lid on some of the SCREAMING! that seems to be everywhere today. Because the “typed internet” offers us two layers of depersonalization and camouflaging. The first layer is the fictional avatar identity, like “nomadguy23″. The second one is keyboard-typing. It is less personal than handwriting, and definitely much less personal than talking. No wonder it’s tempting to snipe. I have a feeling that an internet of voices will be a more polite internet: First, because our digital assistant phone will be right there “listening” to us. Even though he/she/it might not be real, it is a completely different experience from posting into an anonymous form field. Most of all though, talking aloud makes us socially accountable. Remember when our parents explained the concept of “outside/inside voice” to us? I sure think so. And I definitely hope so, or the subway of the future will have to make do without me. PS: Longer interview with the founder of Siri is here. Well worth watching.